There was a time, so many years ago now, when it felt like we had too much Metroid. 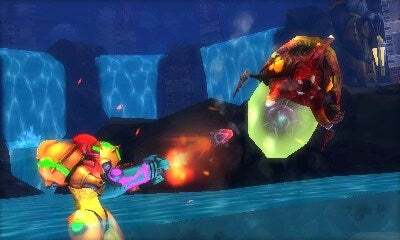 The simultaneous launch of Prime and Fusion in 2002, followed up with another one-two volley of Metroids two years later. "Slow down!" we cried. "We can't keep up with all this Metroid!" Since 2010's Metroid: Other M on Wii (which, cards on the table, I enjoyed), we've had not a peep from the galaxy's foremost nonlinear backtracker Samus Aran. Last year's team-based shooter Federation Force was fun, but it was as much a Metroid game as Metroid Prime Pinball was. We're nearing the end of a seven-year Metroid drought. Enter Metroid: Samus Returns, a game with far, far too much weight on its spherical shoulder pads. To be released September 15, it's a 3DS remake of 1991's Metroid II: Return of Samus for the black-and-white Game Boy. It's not fair that a do-over of a 25-year-old game on six-year-old hardware should bear the burden of being the official Return of Metroid, but, well, whose fault is that? I was playing Samus Returns during my trip to PAX West earlier this month, and when people found out, I kept getting the same question: "Is it legit?" Nobody wanted to ask about any specific details of what was inside the game. Their worries were far more fundamental and existential: Did development studio MercurySteam, best known for making bad Castlevania games, get it right this time? Is this really a Metroid? Yes, Samus Returns is legit. Yes, it's really a Metroid. The controls are precise, the music is lovely, the caverns are dense and full of secrets to discover, and everything gels well together into an experience that is unmistakably Metroid. It doesn't take many risks, and doesn't do a whole lot to push the series forward — but to be fair, that's not what the series needed in 2017. Viewed in the context of the entire series, Metroid II is the weird one. Following the events of the first game, Samus is dispatched to SR388, home planet of the Metroid race, to do some good old fashioned genocide and eliminate the entire species. Thirty-nine Metroids are somewhere on the planet, and you have to root them out and fill them up with missiles until they explode. Rather than the usual formula of Samus gaining new abilities that let her explore more and more of a given planet, the world opened up in a less natural way: clearing all of the Metroids out of an area would cause a pool of lava to drain, giving you access to a deeper section of the planet. Samus Returns does not depart from this general concept, although it tweaks the particulars. Rather than unexplained lava-draining earthquakes that are somehow connected to Metroid mortality rates, each section of the planet has a massive statue presumably built by the ancient Chozo birdfolk that requires you to fill it with Metroid DNA before it drains its pool of damaging purple fluid. This is no less explicable from a plot standpoint (who would build something like this?) but at least makes it crystal clear to the player what they need to be doing. Apart from many small tweaks such as this, Samus Returns is a pretty straightforward remake and takes no weird swerves, except for one. And it's a doozy. 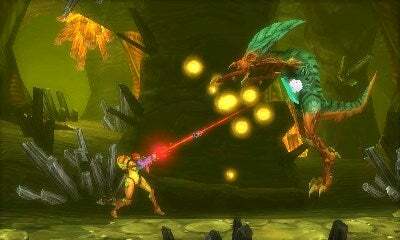 Samus, in addition to her many types of guns, can now perform a melee attack. This can be used at any time to knock back an enemy. But enemies no longer just lazily fly back and forth or creep up the sides of walls. Most enemies, when they see Samus, will rear up and charge at her. If you use the melee attack at just the right time (just after you see a very clear flash), you'll break the enemy's charge and send them reeling and stunned. And right at this moment, if you start firing your cannon, Samus will automatically point at the enemy, and the bullets will do much more damage, eliminating an enemy in a single shot or two that ordinarily would have soaked up ten or more hits. I want to be clear: this sequence of moves is, speaking generally, not optional. If you try to play this like a normal Metroid — if you ever say, well, I'll just try to run through this part and strafe and dodge rather than individually taking on each enemy — you will die. Or you'll knock off half your health, then stumble into a Metroid battle at a significant disadvantage. Samus has 360-degree aiming in this game while standing still, which is useful, but if you try to take out an enemy by standing still and firing, it will charge you and do big damage before it dies. And its friends will be right behind. So you've got to take the corridors of SR388 slowly, separating enemies from each other, waiting for their attacks, parrying them, dispatching them one at a time, learning all the precise timing. In this way, you could say it's like the Dark Souls of Met — oh my God, I'm so sorry, I have committed a crime against game reviews and I don't even play Dark Souls. Suffice it to say that I really enjoy this gameplay twist. It's satisfying to perfectly bat an enemy away, then put two in its head in one clean manoeuvre. The game is not particularly mean to you. Yes, you can die pretty easily and start over from the last save point that you visited, especially in the beginning when you're still getting your feet wet. But taking an elevator, or a transporter, or starting or finishing a Metroid battle all count as checkpoints (though not save points), meaning death seldom sets you back very far. It makes sense that Samus Returns' big twist would be to deepen the combat, since Metroid II is such a combat-heavy Metroid. Its exploration is broken up by 39 boss fights plus some extras. You'll enter a door and be locked in a room with a Metroid until you defeat it. There are three different forms of Metroid that you'll fight most often, but the game varies these fights in clever ways. It might give the Metroids different elemental abilities. 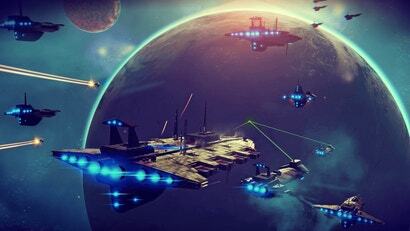 It might change the geography on which you fight them, adding pools of lava or other environmental hazards. Sometimes the Metroids even leave the room, forcing you to continue exploring to find out where they got off to. Additionally, while you do progress lower and lower into SR388's caverns in a linear fashion, the Metroid fights aren't so linear, since you may run into weaker Metroids even deeper down. This is nice, since it gives you a breather from having to constantly take on harder and harder challenges, and lets you see how far you've progressed — both in terms of upgrades for Samus' suit, and also your own skills. Speaking of upgrades, SR388 is packed chockablock with them — all the upgrades from the original Game Boy game, plus many more. In addition to the expected stuff like the Varia Suit and the Screw Attack, there are also four new Aeion abilities, which use their own meter. These can be used to power up your beam, absorb damage, slow time, and, perhaps most controversially, reveal sections of the map around you. Metroid II's version of SR388 was fairly linear and simple. This version is much more convoluted and dense. 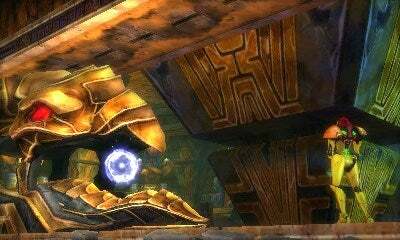 Other Metroid games might hide cool secrets in obscure places, but this one forces you to navigate many non-obvious pathways simply to make forward progress and root out the Metroids. The first Aeion ability you get lets you permanently reveal a bit of the map, and even shows you what sections of wall around you can be broken with a bomb or other weapon. I didn't use this all the time, but I definitely didn't hesitate to use it when I was scratching my head over where to go next, or if I saw something shiny that I couldn't get to. If you're having trouble finding the next Metroid, you can head back to the statue and upload what DNA you do have, to get a hint. If you have a Metroid Amiibo, you can scan it to see precisely where another Metroid is lurking. Another question I got a lot of: "Is there backtracking?" Yes, in a sense, although this was the weakest part of the experience. Since SR388 was then and is now chunked out into 10 discrete sections, you lose that sense of having one single labyrinthine world that loops back into itself in interesting and surprising ways. But within those sections there are many, many doors that you cannot open, or areas you cannot traverse, and later in the game you can take one of the fast-travel transporters back there, open the door, and 99 per cent of the time just find a missile upgrade. Or a Super Missile. Or a Power Bomb, which I guess can be used to wipe out a room full of enemies but in practice is only really used when you need to blow up a block with a Power Bomb symbol on it. 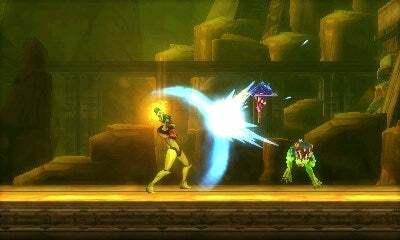 "I Want My Baby [Metroid] Back"
Metroid's back, and it has parrying! Lots of volume. A nice twist on a creaky old classic. Disappointing rewards for backtracking, one part of one boss, fairly unsurprising. There is a fun twist to taking the time to backtrack, though, which is this: The enemies actually get more powerful as you go lower into SR388, and your beam upgrades tend to keep pace with them, so when you return to previous areas, you'll find that you don't actually need to worry about parrying anymore. So the boredom of retreading an earlier area just to get back to where you left a Super Missile three hours ago is greatly alleviated by the fact that you can just lean on the fire button and destroy everything in your path. Even if you don't go backtracking — honestly, it's not especially rewarding — you'll spend a lot of time in Samus Returns. Which is nice, as it would be a shame if Metroid's big comeback was over as soon as it began. Once you beat the game, you can play it again on Hard mode. If you buy the two-pack of Samus and Metroid Amiibos, you can scan the Samus amiibo after you beat the game to unlock Fusion mode, which is harder than hard and features Samus in her Metroid Fusion suit. I played a minute or two of this, just enough to determine that you can still kill enemies with a single hit if you do the melee counter. There is a little bit of bonus content that occurs after the place that the original game ends, including a late-game twist that you could probably figure out if you were very observant and knew the original game back to front. But there's nothing that approaches the sort of magic twist that Zero Mission pulled when it re-told the story of the original Metroid. Metroid II exists in this strange state — its storyline and events represent this key moment in the series' chronology, but the game itself, on the black and white Game Boy, is difficult to go back to and enjoy. Samus Returns presents a much more palatable way to experience this story, and for diehard fans who know every inch of the monochrome version of SR388, this stereoscopic 3D version is vastly different enough in gameplay and geography to be considered an entirely new entry in the Metroid series. The Metroid story is one of feast or famine. 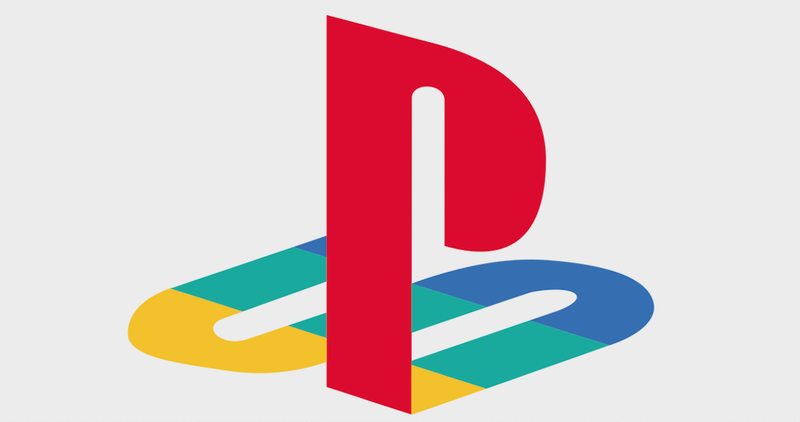 That avalanche of new games in the early 2000s itself followed nearly a decade of dormancy. I hope that Samus Returns' title has some greater meaning beyond being a simple inversion of the Game Boy game's, and indeed heralds the return of this sadly neglected series. Samus's return to the past was fun; now here's looking to the future. Metroid II exists in this strange state — its storyline and events represent this key moment in the series' chronology, but the game itself, on the black and white Game Boy, is difficult to go back to and enjoy. It really isn't. Played it a few times over the last maybe fifteen years or so since I first got it and it's been thoroughly enjoyable every time. I played it back in the day, but I gave up after a few hours. I could never navigate the environment because everything just looked the same. Apparently using the Super GameBoy helped a little by adding some colour to the game, but I look forward to this version of the game. I don't own a 3DS myself, so i'll be picking this up Saturday for my girlfriend...I just hope she's nice enough to let me play it first.